Mobile Software Development Company In Boise, Idaho - AHG, Inc.
AHG, Inc. develops integrated cloud-mobile applications (Android and iOS) that increase business productivity and add to your bottom line. We specialize in business mobile applications in the area of inventory management, mobile data collection, workflow and business process documentation. Contact us for custom mobile applications development, or check out ready-to-go inventory and data collection applications. Custom mobile applications for businesses integrated with internal systems and software. We specialize in the applications in inventory management, asset tracking, mobile data collection, business operations tracking and workflow. Native mobile applications made to your specifications, developed in the US (Boise, Idaho). Smartphones and tablets: iPhone, android smartphones, iPads, android tablets. Integrated to backend database and your internal business software. Web based dashboard for administrative tasks. Submission to the Google Play and Apple App Store. We specialize in connected mobile - cloud applications for businesses. Areas of expertise include mobile forms, mobile data collection, QR codes, NFC, inventory management, asset tracking, equipment service and maintenance and other business productivity applications. Remote Data Access Business mobile applications connected to a centralized database for data exchange. QR Codes And NFC Inventory management, mobile data collection using QR code / NFC tags scanning with a smartphone. Mobile Forms And Data Collection Data collection applications using custom mobile forms. Documenting Business Processes Documenting business processes and procedures using mobile application. Mobile B2B Ordering Placing B2B restocking orders on a smartphone using barcode / QR code scanning. Hardware Integration Integration of the mobile applications with the hardware connected via a bluetooth, such as barcode scanners. QR Inventory Inventory management and asset tracking using a smartphone for barcode scanning, data entry and look up. QR wave B2B ordering mobile application. Dairy Cents Mobile application for the farmers to calculate profitability. Lak & Know-How B2B ordering application. Food Safe Surveys Mobile application for taking food safety audits. WDS Logistics Tracking customer's containers storage and delivery using a smartphone and QR code scanning. Cloud Note Documenting business process or procedure using a smartphone. mCatalog Mobile catalog for B2B and B2C mcommerce. OnQ Business mobile messaging application. Crop Cents Mobile application for dairy farmers to calculate their food growing expenses. Brennan Training Mobile application for the users to download and listen audio lessons on their smartphone or tablet. Herd Metrics HTML5 application for the farmers to calculate annual heifer production. Cloud software with supplementary mobile application that you can start using right away. Use as is or customize to fit your business requirements. QR Inventory is a simple, yet powerful cloud-based inventory and asset management system that utilizes QR codes, NFC tags and smartphones for fast and error free inventory tracking. Affordable and customizable. Track assets and inventory using a smartphone for barcode / QR Code scanning, data entry and look up. Access real time inventory stock, locations, transactions history and usage via the admin web interface. Customize the system to fit your business process and workflow. Define what do you want to track, record and report via the web dashboard. Allow your employees to access asset and inventory information, location, stock by scanning QR code / barcode label with a smartphone. Capture photos, signatures, GPS location with the mobile application. Create pdf documents for inventory transactions on the spot. View, print or e-mail from a smartphone. Use barcodes, QR codes or NFC tags. Use built-in QR code generator to generate, lay out and print QR code labels. Automate your business workflow by tracking business operations and processes, filling out mobile forms on site using a smartphone or tablet. 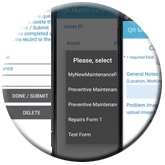 Whether you are managing equipment or properties, tracking manufacturing process or custom project progress, need to conduct inspections or submit reports from the field - QR Mobile Data will allow you to create custom workflow and mobile forms that fit your purpose. Create custom workflows, mobile forms via the web dashboard. 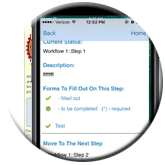 Link mobile forms to the workflow step(s), or use mobile forms independently. Your employees can track the process, move it to the next step, fill out mobile forms on site using regular smartphones or tablets for barcode scanning and data entry. Submit data to a centralized cloud location in real time. 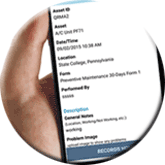 Field technicians can review asset, project or property information, what was done previously, and submitted forms by scanning QR code / barcode label with a smartphone. Capture photos, signatures, GPS location with the mobile application as part of a form submission. Create pdf report based on the collected information. Include collected data, images and signature. View, print or e-mail pdf report from a smartphone. Access projects status, progress, history, filled out forms via an admin web dashboard. Use multiple reports and filters to find required information fast.